The Florida Legislature meets once a year for 60 days to address the needs of our state. With a population of more than 19.89 million (2014) people, there is much that must be discussed in our annual legislative session. Bills are filed by Representatives and Senators for consideration during the session. When a bill is filed, it is referred to several committees to be reviewed by smaller groups of members. Through the committee process, the bill is discussed and debated and amendments or changes can be added to the bill. This process allows the idea to be thoroughly discussed and debated by the legislators, the public and those specific people who the bill will affect. After passing out of committees the bill is brought before the entire chamber of the House and Senate. 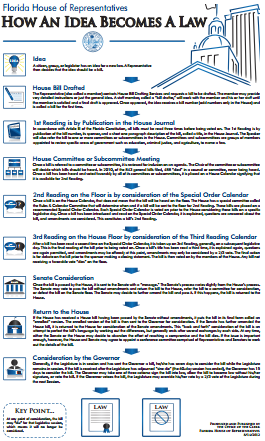 Committees have several options when considering a bill. They can approve the bill. They can defeat the bill. Or they can choose to amend the bill. If a bill is defeated in committee, that idea is dead for the rest of session. Once the bill has passed each of the committees to which it is assigned, it is available to be voted on by the entire body of members. A bill passes by receiving a majority of the votes in that chamber. Each bill must be passed by both chambers before it becomes a law. If both chambers approve the bill, it goes to the Governor’s office for his consideration. The Governor can sign the bill, allow it to become a law without his signature or veto the bill. If the Governor chooses to veto a bill, the Legislature can overturn the next time they meet by a two thirds vote of both chambers. If a bill doesn’t make it all the way through this process before the end of session, that bill dies and must begin the process anew the next year. 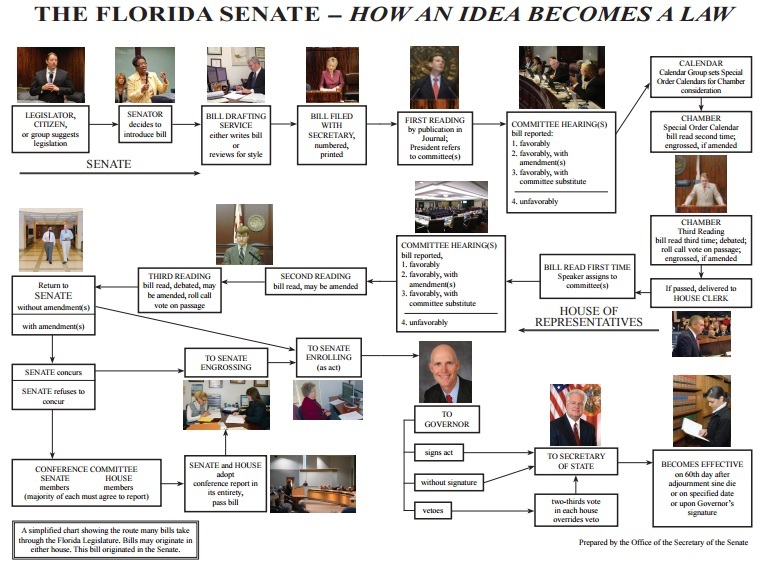 To view a chart that shows the path a bill takes in becoming a law in the Florida House CLICK HERE and a chart showing the same process in the Florida Senate CLICK HERE.